The best shorts 2018 has to offer! The quirky story of Gaspar Rubicon, who wakes up from a coma speaking a fully formed but unrecognizable language, baffling linguistics experts from around the globe. A sometimes funny, sometimes heart-breaking story of a very isolated person. Written by Academy Award® winner Benjamin Cleary (Stutterer), and co-directed by Cleary and T.J O'Grady Peyton, screenings of this film always evoke waves of laughter. Eight-year-old Jesse lives in a twilight world of sadness and silence, squeezed into a tiny caravan with his grief stricken father. Both are stuck in a rut, until an accidental friendship with a V8 driving transsexual unlocks the means for Jesse to liberate him and his father. In a small rural Finnish town, on the eve of his 16th birthday, a boy secretly smuggles home a girl. Next morning, the boy’s father accidentally walks in on the young couple’s tender moment. To their horror the teens notice their protection has failed and the nearest countryside pharmacy is closing soon. They make up an excuse to get the father to drive them there. After a series of unforeseen and unfortunate events, the true nature of their trip is revealed. Arriving home for a final resolution, this charming film has a delightful denouement. Kelly lives a lonely life in a busy city – unfulfilled and longing for more. Behind closed doors she wonders – is there anyone who can understand her? When new neighbour Jonny moves into the adjacent building, he captivates Kelly. She observes his daily routine and soon learns that something is very different about him. Kelly goes on a journey to uncover more about Jonny and in doing so, confronts her demons. A dark comedy about the unbreakable connection of identical twin sisters. Velika Bortsov works in a spa shop while her twin sister, Nouchka, is a professional rhythmic gymnast. Their mother, Dina, has pinned her ambitions to Nouchka’s gymnastics career and in her determination to win, she drives a competitive wedge between her two daughters. Velika and Nouchka are seemingly isolated from each other, leading very separate lives, until a turn of events reawakens the power of their unwavering bond. Against the backdrop of 1941 London, Little Bird explores how far one young woman with a secret will go, to expand her limited horizons and herself, when the women of Great Britain are called upon to aid the war effort. Featuring multi-award winning British actress Imelda Staunton (Vera Drake; Cranford; Harry Potter) and Irish writer and actress Emily Taaffe, Little Bird is a very impressive film with a shocking twist. A short family action-adventure film in the vein of sci-fi fantasy films of old. A 16-year-old boy believes he can save his terminally ill brother, with an ancient, sentient plant he’s unearthed in the garden centre in which he works. The film stars Fionn O’Shea (Handsome Devil, Siege of Jadotville) and Jessica Barden (The Lobster, Far from the Madding Crowd). In an homage to the Spielberg films of the 80’s, this is a cinematic encounter to be relished. This powerful short film stars: Jason Butler Harner (Ozark; Ray Donovan, Scandal), Dale Soules (Orange is the New Black), Frank De Julio (The Night Of), Daniella De Jesus (Orange is the New Black), Lauren Hines (Where You Go). Seven-year-old David convinces his lumberjack father into taking him into the rugged bush of New Zealand, but his eleven-year-old brother Nathan, doesn’t think David is up to the challenge. That night in the forest hut Dad’s workmate, Toko, tells a tall tale of a notorious possum named Scar, setting David’s nerves on edge. After a rough sleep in a tent, terrorised by night creatures, Nathan drags David into the forest to hunt the possum from Toko’s story. Nathan hatches a plan to capture the beast, but Scar is not like any other possum. David must face his fears to prove himself to his brother. 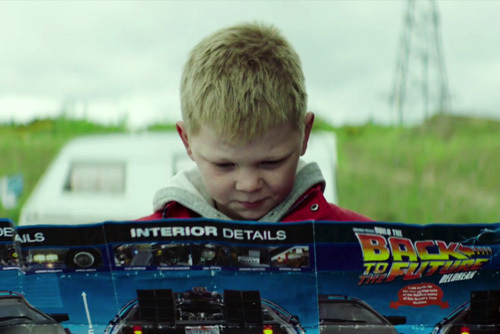 The charming story of a Back to the Future-obsessed 10 year-old named Martin, who is trying to build his own low tech version of that DeLorean, out of an old car and bits of scrap. When Martin’s family is told they are to be evicted from their halting site, Martin races against time to finish his project, creating tension between him and his father, with not a flux capacitor in sight. 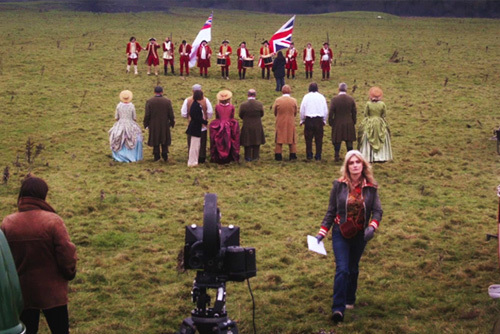 A big scale, big hearted romantic comedy set behind the scenes of the filming of the Stanley Kubrick motion picture Barry Lyndon, which was shot in Ireland in 1973. Many myths and legends surround the director and none more so than his dramatic and sudden departure from Ireland. Narrated by Brian Cox, this story finds two young lovers - one an Irish extra playing a British Redcoat, the other an English assistant director - from different sides of the camera tracks, looking for romance on the film set. Hugo was born with unusually long fingers that became the taunt for other children in the orphanage, where his parents had abandoned him. Alone at night, to overcome his loneliness, Hugo created hand shadows that narrated fantastic tales. Now a young man, he lives a solitary existence in an abandoned theatre fearing the mockery of others. Wishing to share his stories, Hugo decides to platform “The Ugly Duckling” in this disused venue. Will his puppet show performance win over his audience? More importantly, will it win the admiration of Cassie, the beautiful origami girl? Hugo is a charming homage to Tim Burton’s movie oeuvre. At heart, Guy Smith is a poet. But his day job is to fire 12,000 contractors from a spreadsheet – a demeaning, thankless task. Jaded by the world around him, longing for something more meaningful, Guy decides to reach out through his computer screen, into the ether, and make a genuine connection with a stranger. The stranger turns out to be Parvez Mahmood: family man, contractor, and maybe even… a friend? A deeply affecting and beautiful drama starring multi award winning, and twice Oscar® nominated actor Sir John Hurt, which deals with difficult pertinent issues. Not without wry humour, this uniquely lyrical drama is bound to move its audience in a profound and visceral way, across all generations, as its themes resonate equally with both young adults and those in the twilight of their lives. A wonderfully human film with a huge heart, written and directed by UK actor Nick Moss (BBC’s Banished). Meeting his friend in the Mash and Pie cafe, Patrick is flattered when Donald asks him to be his Best Man. However, his delight turns to horror, when Donald explains that his next task is to kill his fiancée, Jean. All he wants from Patrick is for him to give him an alibi for the time of the murder! A real test of friendship ensues as Patrick learns of the absurd standards that Donald expects of his best man. 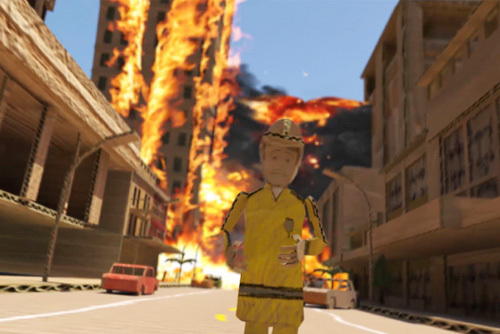 When a city made entirely from cardboard catches fire it's up to the local fire chief and his brave deputies to save Cardboard City and its citizens from impending doom. A comedic suspense-filled animation that is fascinating to watch, particularly its brilliant crayon drawn animated characters.